Java EE 7 includes many new features - one of which is JSR-352, which brings Batch Applications to the Java platform. Here I define a ludicrously simple batch job and execute it on the Glassfish 4 nightly build. I still find the inclusion of JSR-352: Batch Applications for the Java platform into the Java EE 7 specification a slightly surprising choice. Many systems built with Java EE will be online only and have no batch requirements. Those that do need batch processing (non-interactive, typically record based, etc. ) will probably have rolled their own technical and operational solutions e.g. popping messages onto a queue and letting JMS listeners asynchronously handle the work, or writing a shell script which fires up a JVM to perform some long running process. There are other solutions such as Spring Batch and WebSphere Compute Grid, so in fairness to the spec there are many disparate implementations doing nearly the same thing. Rather than reinvent the wheel each time I guess it would be nice for these batch jobs to be portable and maintainable by the Java EE community. All long running batch jobs have some common characteristics too e.g. handling and recovering from failure. Historically Java EE standardises what has already become a good idea elsewhere; JSR-352 seems no different in this regard - as far as I can see it combines elements of Spring Batch and Compute Grid. Maybe making batch a standard part of Java EE 7 will give large Financial Services companies the confidence to migrate their COBOL based batch processing to Java. Batch is critical to these businesses - as a recent case at the RBS bank highlighted. I don't think including batch in Java EE 7 means such companies will immediately plan to migrate their batch processes to Java, but it will probably progress the discussion. The most interesting part of JSR-352 is undoubtedly the Chunk Processing. This is where a batch step processes data e.g. millions of records from a database cursor. Some logic is applied to each record and then its transformed output is written out in chunks (to a file, database, etc.). Basically Chunk processing is where the real work happens! I am using Intellij to develop on the iMac, but any IDE or OS will be ok. I’m also using a version 7 JDK. I created my Batchlet by implementing the javax.batch.api.Batchlet interface. I can inject the JobContext and StepContext instances using CDI - these instances give me information about the whole job and the current step. On Glassfish these ids just increment upwards from 0. I have added logic which throws an unchecked Exception when the executionId is even. This means that execution should fail. If the job is restarted it will be assigned another executionId which should be an odd number (as I am the only operator using my Glassfish server) so it should then succeed. 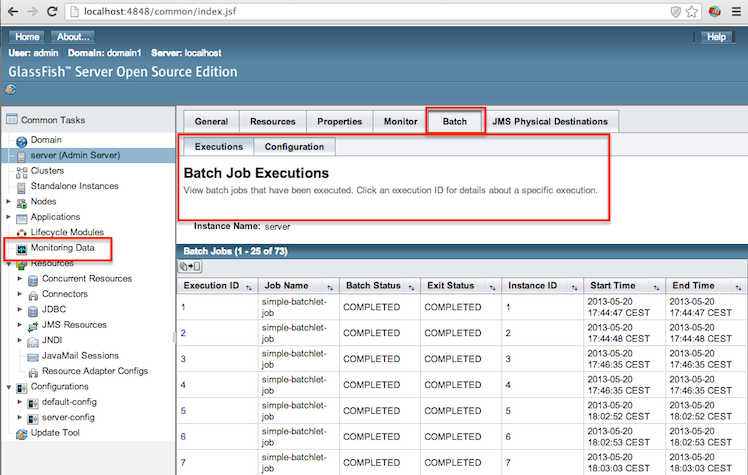 "View details for Execution Id "
Now the job instance has COMPLETED successfully. Notice the instanceId of 58 - this remains the same over restarts because this is the instanceId of the Job - which only gets assigned when JobOperator.start is called. I hope after reading this you have a general idea about JSR-352. Over the next few months I’ll be experimenting a lot more - chunk steps, checkpointing, transactions and partitioning. The source code for this example is on github. I’d love to hear your feedback or suggestions.